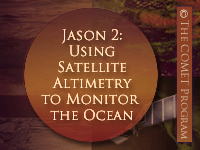 Altimeters onboard satellites such as Jason-2 measure sea surface height and other characteristics of the ocean surface. These characteristics are linked to underlying processes and structures, making altimetry data useful for understanding the full depth of the global ocean. This 75-minute module explores major discoveries made possible by altimetry data in oceanography, marine meteorology, the marine geosciences, climate studies, the cryosphere, and hydrology. For example, altimeters have played a vital role in detecting and monitoring sea level rise and its relation to climate change. The module also describes many of the practical applications of altimetry data, for example, in hurricane forecasting and monitoring climate events such as ENSO. Finally, the module describes Jason-2, which was launched in 2008, its products and services, and the Ocean Surface Topography Mission (OSTM), of which it is a part. OSTM is a collaboration between EUMETSAT and CNES (Europe) and NOAA and NASA (United States). The module was very informative and well presented. For the newer personnel in my Branch, this info will expedite their understanding and foundation of what, why, and how altimetry works and is utilized in our operational processing. I've worked in the satellite altimetry field since the GeoSat mission, so having what I've learned through years of investigation and operational application condensed in an easily understandable medium is invaluable. Great Work! 2 July 2015: Added an introductory note: This lesson uses Jason-2 to show how altimeters work and the general applications possible with altimeters. Since Jason-2 was launched other altimeters have become available (e.g. Altika, Cryosat, Jason 3) and more will become available in the near future (e.g. Sentinel 3) - they all follow the principles and applications described in this lesson.